An afternoon of stenciling can transform an ugly duckling old wooden dresser into a beautiful swan! 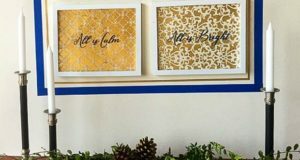 This stencil how-to combines Chalk Paint® decorative paint from Annie Sloan with a fast stencil finish using our Moroccan stencil, Moorish Fleur de Lis. 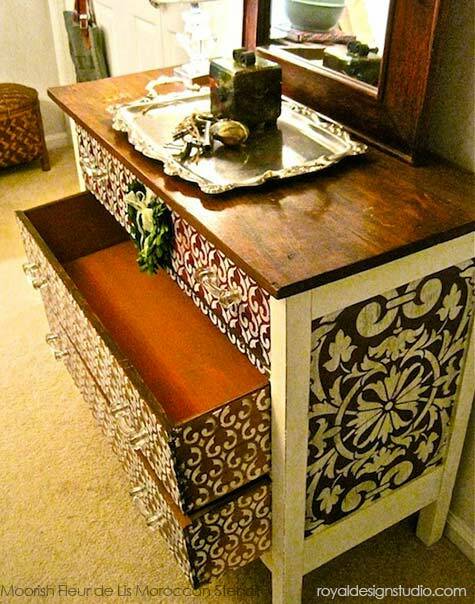 Originally posted on the Annie Sloan Unfolded blog, this stenciled furniture project by Debbie Hayes is the perfect stencil project for beginners and seasoned stencilers alike. Bonus! 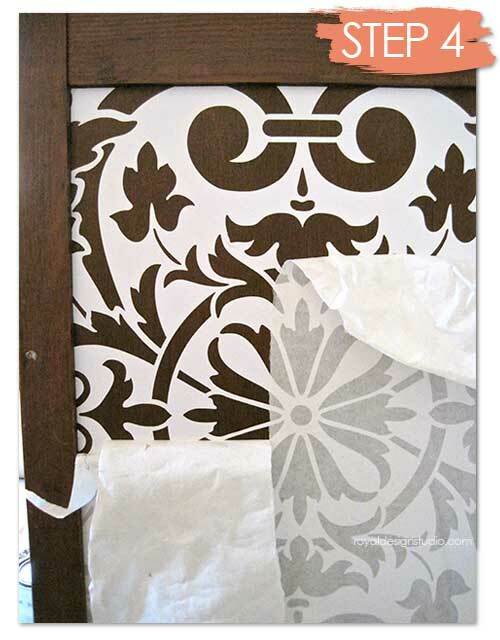 This project also features a one time use vinyl stencil from our sister pattern company Modello Designs. Start your furniture stencil project simply by cleaning the chest well with something like Dirtex or even just Dawn dish soap and water. With Chalk Paint, there is NO need for stripping or sanding-simply de-greasing. Gather your stencil supplies: Moorish Fleur de Lis Furniture Stencil, Old White Chalk Paint, Annie Sloan Soft Wax, 1″ Stencil Brush. Debbie also painted the insides of the drawers with Barcelona Orange Chalk Paint for an unexpected POP of color! 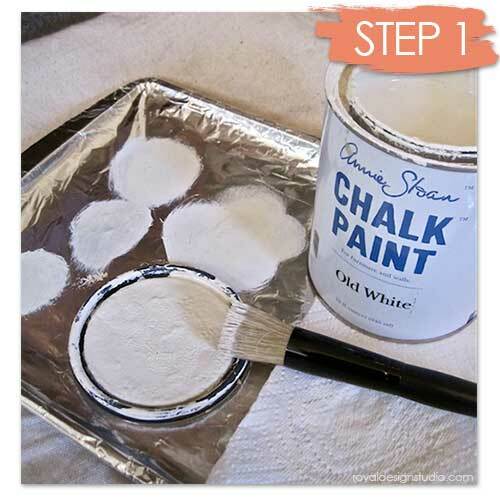 Step 1: Chalk Paint® is GREAT for furniture stenciling because it covers quickly and dries fast. You can pour out a small amount into a small plastic cup to keep the paint from drying out in the can. Dip JUST THE TIPS of the stencil brush into the paint and offload the excess paint by swirling onto good quality paper towels. Step 2: If you want your allover stencil pattern to end the same on the left and right sides, begin by centering a vertical row of the fleur de lis elements in the center front of the chest. 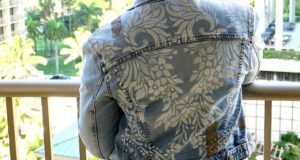 If you a going for a distressed stenciled look (like Debbie) don’t worry about getting completely even coverge with the paint. If you want a more solid look, you may need to stencil each area twice for complete coverage. The Moorish Fleur de Lis has built in registration marks (like all of our allover pattern stencils) so it is easy to line up each repeat of the stencil perfectly. Step 3: For the side panels, Debbie used vinyl stencils that she had from our sister company Modello Designs. 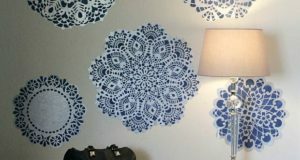 These are one-time-use, adhesive backed stencils, and this pattern is available to be custom-sized as OrnPan111. She measured her side panels and cut the pattern to fit. This particular design is ALSO available as a reusable mylar stencil on this site. It is the Villa Classic Panel Stencil-and may be the perfect fit for YOUR furniture stencil project. 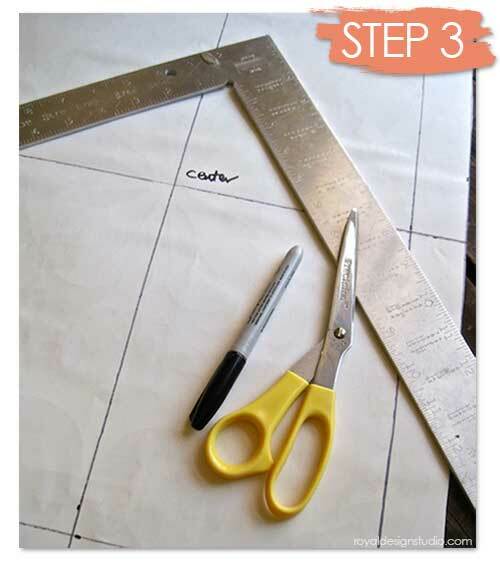 Step 4: Install the Modello Designs vinyl masking stencil (if using) according to the included installation instructions. Basically, you need to burnish the design, remove the protective Backing Paper, adhere to the surface, burnish again, and then remove the Transfer Tape (shown). 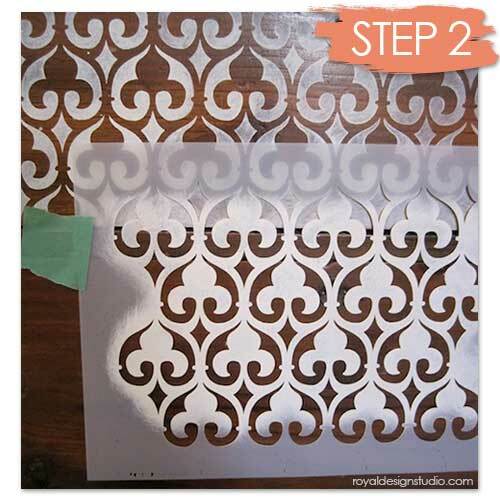 Step 5: Stencil the masking stencil pattern as you did the mylar stencil pattern in Step 2. 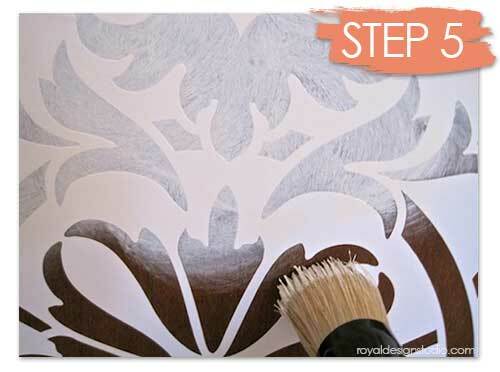 Step 6: Allow the Chalk Paint® stenciled areas to dry thoroughly. 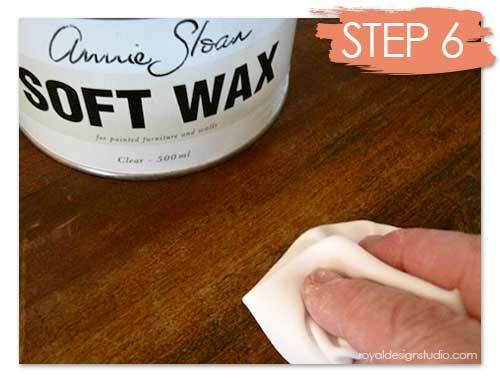 Apply a coat of Annie Sloan Soft Wax with a brush or soft cloth. The Soft Wax will soften the Chalk Paint a bit, so if you rub hard you can further distress and soften the stenciled areas as you wax. If you DON’T want further distressing use a lighter pressure. Either way, you will want to remove the excess wax as you work with a clean cloth. Allow the first layer of wax to dry about 30 minutes and repeat with an additional layer of wax for more protection. Let your final layer of wax dry for several hours (or overnight) and buff to a soft sheen. Note: if you want to “antique” your stenciled finish, you can substitute Annie Sloan Dark Wax for the second layer of wax. 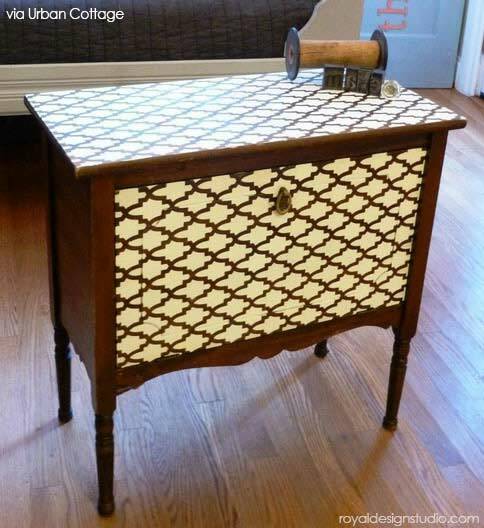 Accessorize your finished furniture stencil project with some new fancy drawer pulls! We love how Debbie left the top of the chest unpainted. 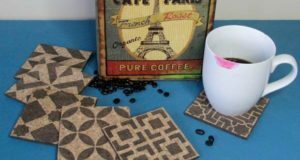 It allows the stencil pattern on the front to really stand out-and if you wood is in decent shape, this is a great option for stenciled furniture. 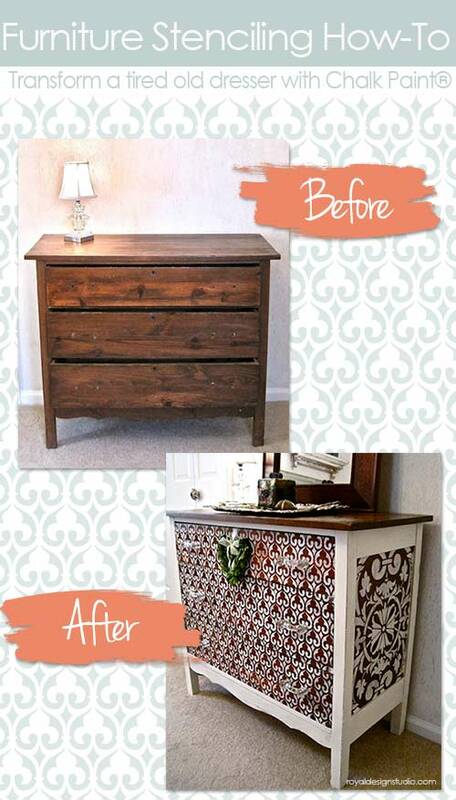 Here is another cute take on a Moroccan stenciled furniture project from our friends at Urban Cottage. Here, the Small Moroccan Arches furniture stencil was stenciled sideways on a small furniture piece. Again this combines stenciling with a color like Old White Chalk Paint and leaves some of the wood unpainted for a great custom finish. 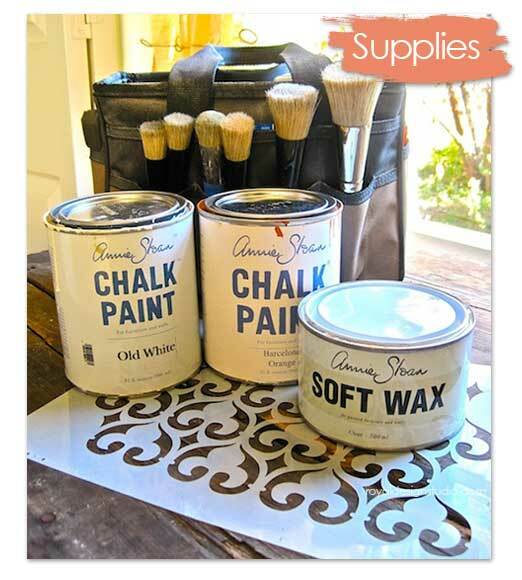 Find more Stencil and Furniture Painting Tips with Chalk Paint® Decorative Paint! This makeover is amazing. This dresser would cost a fortune from a catalog. So true Elisabeth!! And it is so much more personal and interesting to do your own stenciling and painting on furniture! What does the fleur de lis stencil project cost? I love the Moroccan theme, and want to paint my bathroom sink cabinet like this, but cant get the stebcil link to come up.